What is a Bicycle Smoothie? This photo from the opening day of the Shoreline Farmers Market was a puzzle. Just what is a bicycle smoothie? The bicycles and riders were obvious in the photo, but smoothies were nowhere in sight and staff appeared to be standing around, rather than handling blenders. Fortunately a reader has provided an explanation. These are the best smoothies you will ever taste! All natural, organic ingredients, with honey or aguave used to sweeten. The blender is connected to the bike wheel, so the blender whirls as you pedal the bike! 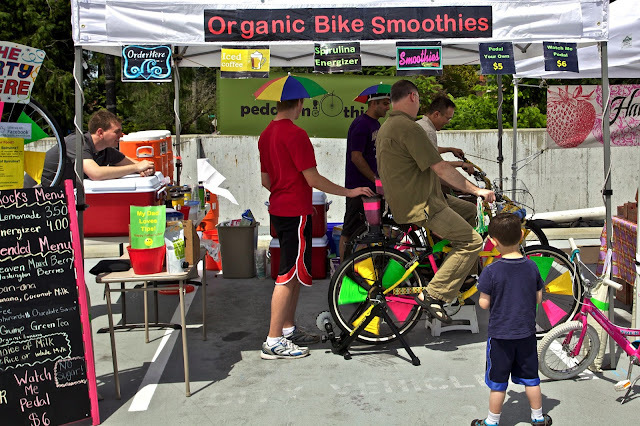 They will blend it for you, or you can jump on and pedal your own bike (and smoothie) for $1 off! So the staff are the ones in the rain hats, holding the lids on the blenders on the back of the bike. Some photos just require explanation.